McMaster-Carr sells some very nice wheels that are used in industrial applications for moving products, sheet materials, and more they are called "Drive Rollers" on their site. 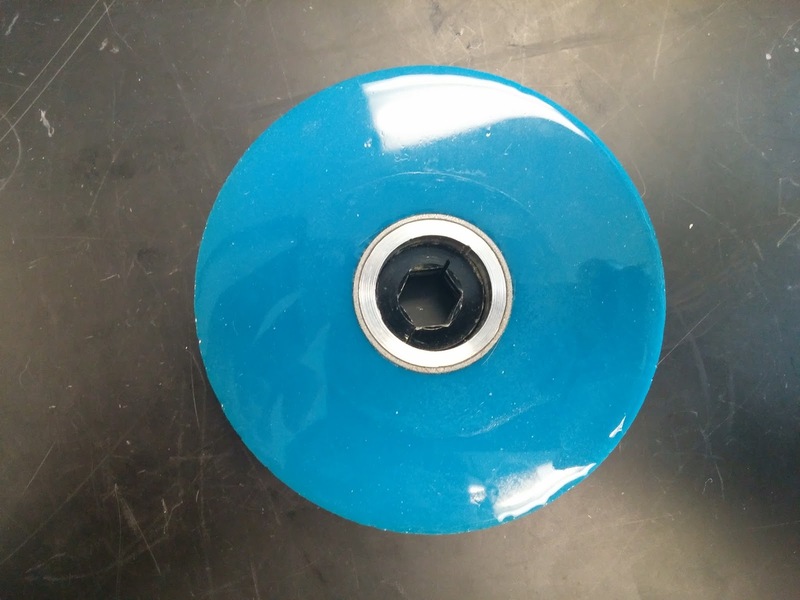 These wheels have been shown to have many applications for FRC teams such as collector and shooter wheels. 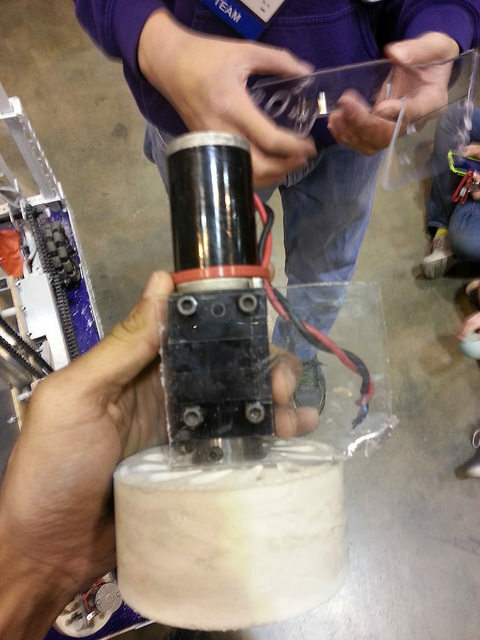 These wheels are great but they don't come with any hub and they can be difficult for teams that don't have access to a lathe or a hex broach to use with standard FRC gearboxes and motors. It's very common for teams to use hex shafts to transfer torque from a motor to a wheel. Using hex hubs is one option to accomplish this and works well for most wheels designed for FRC. Once you want to use an industrial wheel for some application it become much harder to adapt them to hex shafts. VEXpro hex collars and aluminum tubing can often allow for teams without a lathe or a hex broach to use these types of wheels. For the Sure-Grip wheels we have been able to use two VEXpro shaft collars as a hub for those wheels. The built in hub is a 1" diameter and the shaft collars are slightly smaller than this about 0.96 inches. We use the included set screws to tighten the shaft collar down on the shaft. This worked very well for us this season and we never had an on field failure. We haven't used these wheels in competition yet but they have been popular with other teams such as 1114 and 2056 in Ultimate Ascent as their Frisbee shooter wheels. 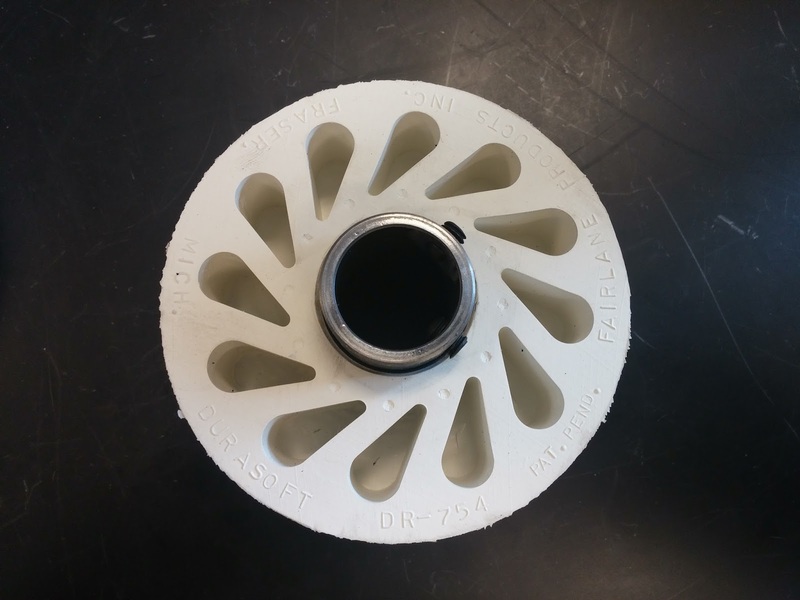 These wheels have a 1.25" inside diameter (ID) which is too large for just the shaft collars. To solve this problem we used a small aluminum pipe cut to the correct length. For these wheels we used a 1.25" OD and a 1" ID aluminum pipe from McMaster-Carr: 9056K37 and we cut down the piece to around 0.92" long. To assemble these we used a small arbor press. An inexpensive arbor press can be purchased at Harbor Freight. With both wheels it's important to remember you are trying to get the hex hubs to be flat inside the tube so the wheels will turn close to true (flat without wobble). These hubs will work better at low speeds since at high speeds the fact that the hubs aren't completely true can cause heavy vibrations. These wheels can then be installed directly on a 1/2" hex shaft such as the output shaft of a Versa Planetary gearbox. The other benefit of this method is that all of these are COTS parts and the assembly can be completed easily at an event without counting to your withholding allowance weight.